Proudly presented as first release on the main FSOS Records imprint is “Numb” from Christian Rusch, who broke onto the scene back in 2002 with heavy support from both Armin van Buuren and Tiesto, and now legendary label Anjunabeats putting out his first release “Epic” (with UK colleague Greg Murray). 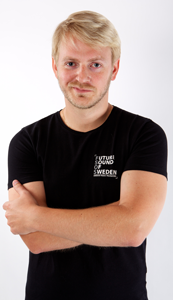 This talented Swede has seen support from most of the best and is respected for his club music to his chillout works alike. Numb was originally written per personal request to be the intro track for CD1 of Markus Schulz’s “Coldharbour Sessions 2004” and as with many other compilation tracks, Numb was never released on its own. A lush piece of artsy progressive music, awash with moody ambient effects and a captivating piano melody, we thought it deserved a full release. To complete the package, we requested some of Sweden’s most current producers to add their own sound to the release. The release features additional remixes from some very prominent Swedish producers. 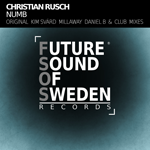 Kim Svärd (Magic Island) serves up a pumping electro influenced trancer, Millaway (Blue Soho Recordings, Echelon Records) delivers a slightly uplifting very “Coldharbouresque” progressive trance remix, Daniel B (an upcoming Swedish producer) who with his progressive touch turns in an almost deep housey remix, and Christian completes the package with his own groovy progressive Club Mix. For the full details if this release incl. previews press here and you’ll be directed to our music archive database. In the database you’ll also be able to download artwork for the actual title and all following releases for the future. Numb is now exclusively available on Beatport, and for all other major retailers the release date is set to be December 10th.